New factions, new cards, new strategies! Not too long ago I was fortunate to cover a couple of cards to preview for the upcoming Warhammer Champions: Savagery set. This new set sees Gloomspite Gitz, Maggotkin of Nurgle and Sylvaneth added to the faction roster. A special event is available via the digital app and this has been a great way to learn more about some of the upcoming cards. Feeling as generous as Nurgle himself, we thought we’d share our findings with you. Warhammer Champions had wad seemed to be a successful launch and I was very lucky to cover the game all those moons ago. Whilst I thoroughly enjoyed the game, I found myself encumbered with multiple new releases thereafter. Champions dropped off my radar some time after, but Savagery sees it bound into my life once more. The digital game for Champions sees a Savagery preview, as it were. You can play two campaigns which feature the new warbands. I’ll tell you some of my favourite cards in the campaigns. You may also get some tips on how to beat the “A Bad Moon Rises” campaign. The first campaign I leapt into had me play as the goblin-tastic Gloomspite Gitz. There are three stages to beat against three different decks. The first battle is against brutish Orruks. This particular battle was horrendously difficult at first. The Orruks are durable and dish out a tonne of damage. There was also a bespoke series of blessings that would deal damage against me if a blessing completed on a lane that held a card of mine. The trick for this is to look at the enemy blessings on each lane and ensure any card you put has fewer corners than there are currently left on the blessing. The Gloomspite Gitz cards themselves were great fun to use, mixing sneaky tactics with low but persistent damage. 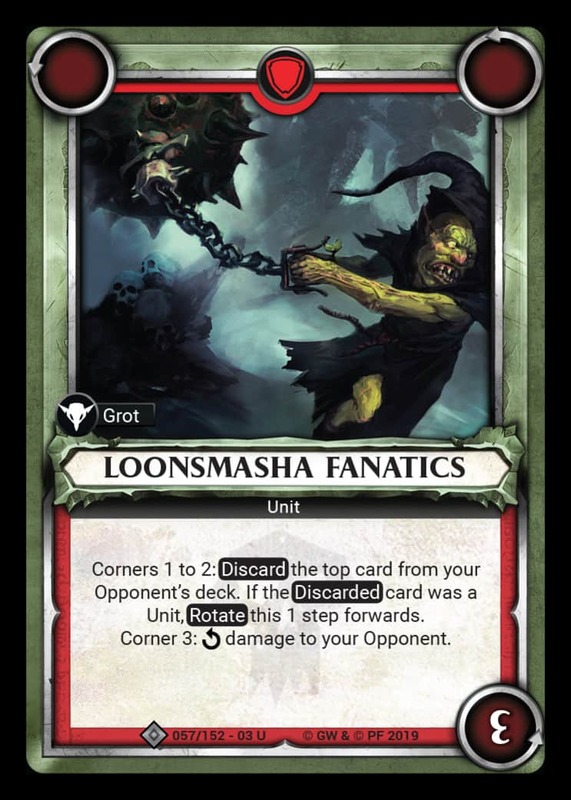 A particular card of note would be the Loonsmasha Fanatics. A unit that has active three corners, they are not to be underestimated. When deployed the opponent reveals and discards the card on top of their deck. If the revealed card is a unit rotates the Fanatics resulting in the opponent needing to do so again. On the third corner three damage is dealt to the opponent. This means that should the opponent draw two units in a row the Loonsmashas immediately trigger three damage. Take a few of these with you and on a good day you’re discarding six of your opponents cards whilst dealing respectable damage. The second battle in the first campaign is against the foul, putrid forces of Nurgle. Another new addition to Savagery, the warriors of Nurgle try to balance health regeneration with damage. In this Savagery preview all the Nurgle champions can return one health when a unit is removed or spell exhausted. Numerous cards have multiple corners with some corners dealing damage whilst others replenishing health. This battle is a constant yo-yo of damage dealt to damage recovered. The trick is to simply be persistent and keep hammering with damage. Drawing frequently helps to achieve this thanks to Skragrott, the available champion wizard. When a spell is deployed in his lane you can look at the top card of your deck. You can then either choose to keep it at the top or move it to the bottom. Finally, you draw the card from the top of the deck. This gives you a very good level of control and scheming. It helped me snag the win by being able to assess what card would be best for the situation. Removing cards from Nurgle lanes before they replenish health along with dealing good damage at the right time. This battle was far easier than the Orruk one but I’d be very keen to see more Nurgle cards. I reckon they could be particularly vicious. 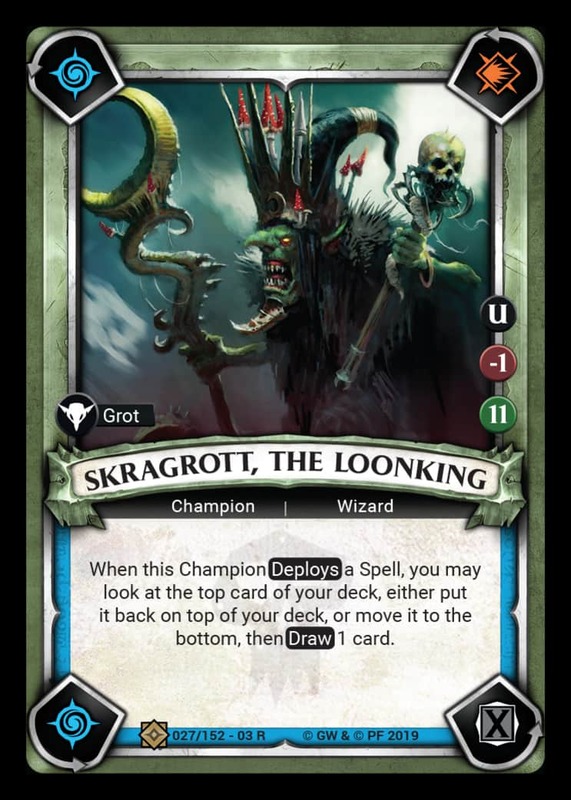 Skragrott’s ability will easily help you win this battle. The third and final battle in this campaign for the Savagery preview has the Gloomspite Gitz take on a warband of Stormcast Eternals. Each enemy champion take the form of Encamped Sequitors and reduce all damage received from units to a maximum of two. This battle took me a handful of tries but was still not quite as difficult as the first Orruk battle. Spells were, once again, another key here. Not just for the sake of working through your deck but also because they could deal feel damage. 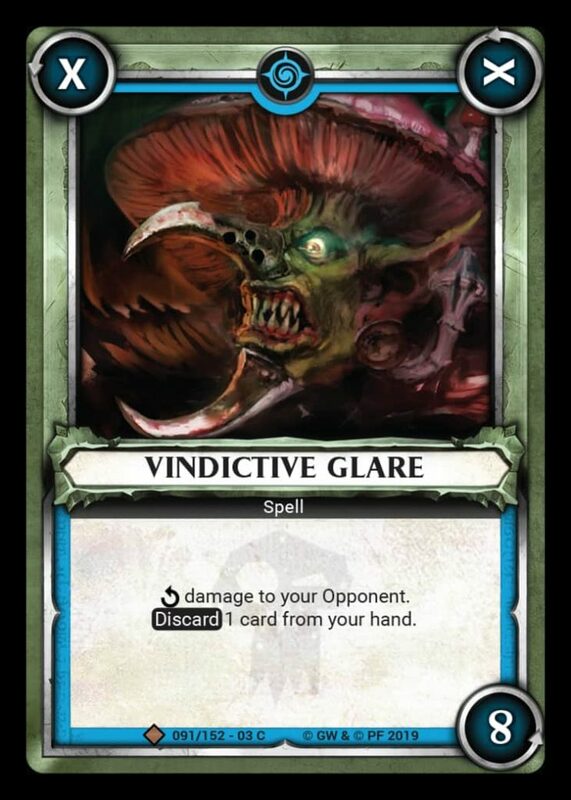 Vindictive Glare was a great card, here. It has two inactive corners but on the third corner will deal eight damage to your opponent. You have to discard a card when it triggers, but it’s worth it. You just need to be wary for any removal cards. The AI in this instance kept using all available cards so this was a little safer than an actual opponent. 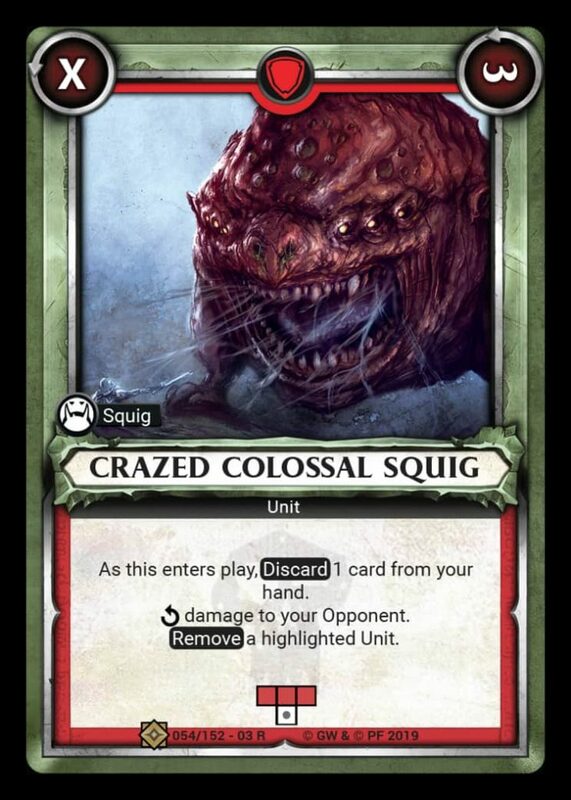 Crazed Colossal Squig is also a card with surprising value. With two corners it has the first be inactive before the second corner deals 3 damage and removes an enemy unit within the closest lanes. Granted, in this battle damage is reduced to two, but removing units after a single rotation is very strong indeed. If you can see a Skybolt Judicator being put down, get your Crazed Colossal Squig out there! There’s another battle in the adjoining Savagery campaign. This one features the Gloomspite Gitz as enemies in one battle, but also the Sylvaneth. Since the goblin-folk have already seen a lot of love in this article, let’s have a quick glance at the Sylvaneth. These guys were horrendous to fight. I beat them after a couple of attempts, but they just took so much beating down! The rate that they can recover health is astonishing. The Sacred Branchwraith grants you a single health point whenever the commanding player discards one or more cards. Spirit of Durthu has a Heroic Act which allows the owner to discard one Sylvaneth unit from their hand and replace it one with from the discard pile. It was a little hard to keep up, getting health regeneration from various units, spells and for just discarding spells? This battle was a real slog. This seems to be the apt focus for Sylvaneth. Almost a bizarre mirror of the Nurgle warband. It’s a little hard to go into more detail on them just yet. With more campaign missions coming soon we’ll hopefully be able to go into more detail imminently in a following Savagery preview. It feels a little odd covering a digital game for what is most definitely a tabletop website. However, the cards shown for the upcoming Savagery release were too tantalising to turn down. Thanks to the upcoming releases I am firmly back aboard the Warhammer Champions train. For now I can’t say that Savagery will turn the game on its head. However, it certainly feels like a fresh jolt of life has hit this tactically delightful game. A jolt that will stir up some excellent new cards that will surely breed vivacious new tricks. If you’ve enjoyed our coverage of Warhammer Champions in this Savagery preview then be sure to pop by our Facebook page. That’s the best place to go to so you don’t miss out on all our upcoming content.